Concerning the early 2012 protests in Barlad, please note that they were organized by local activists with support in the electoral campaign from the Social Democrat Party, which won the elections based on the promise they will ban fracking in the area. Later protests in Barlad were organized by local activist groups only, such as the 8000 people march, in February 2013. 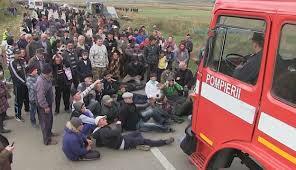 During the National Day of Protest against hydraulic fracturing, on April 6 2014, rallies and marches took place in over 60 towns and villages across Romania, followed by two others on September 14th in Dudestii Vechi and September 28th in Cenad,where several perimeters belong to GazProm. Also, the street protests in autumn 2013 that gathered thousands in major cities across Romania, have been organized by the young urban professional, pro-western middle class activist circles – some of them having learned basic NGO organizational skills through American/Western NGO’s active in Romania. Such allegations are presented in mainstream media for some time; however no proof was ever presented, even though it would be easy for the authorities to verify the source of funding for the grassroots NGOs involved in this movement. How is it possible for the Romanian Secret Service, quoted in your article, to not verify this simple aspect before issuing allegations of any kind. When Mr. Anders Fogh Rasmussen, the NATO General Secretary, declared that Russia is ‘secretly ‘working with environmentalists to oppose fracking, Romanian groups reacted and subscribed the common open letter signed by a coalition of environmental groups and associations, asking Rasmussen to put his evidence on the table or to apologize and redraw his affirmations.